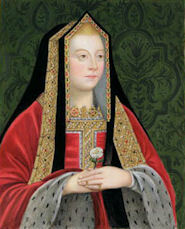 Birth of Elizabeth of York on 11 February 1466 at Westminster. 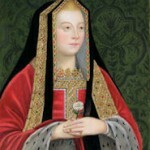 She was the eldest child of Edward IV and Elizabeth Woodville. After Edward’s invasion of France in 1475, in the Treaty of Picquigny, she was supposed to marry to Dauphin Charles. This marriage never took place. After her father’s death on 9 April 1483, she went with her mother and siblings into sanctuary at Westminster. On Christmas Day 1483, Henry Tudor took an oath in Rennes Cathedral to marry her, if he managed to become king. She left sanctuary with her mother and siblings on 1 April 1484. Richard III undertook to find suitable husbands for her and her sisters. This came to nothing and on 22 August 1485 Richard lost his life and throne at the Battle of Bosworth. The victorious Henry Tudor was in no rush to marry her. Parliament reminded him on 10 December 1485, and the wedding finally took place on 18 January 1486. Her coronation was nearly two years later on 25 November 1487. Elizabeth and Henry had eight children, of which four survived infancy. She died on her 37th birthday, 11 February 1503, at Richmond Palace, after giving birth to her youngest daughter Katherine on 2 February 1503, probably from post-partum infection. She is buried next to her husband, who died in 1509, in a magnificent marble tomb in Westminster Abbey. This entry was posted on Monday, February 11th, 2019 at 6:00	and is filed under Events in History. You can follow any responses to this entry through the RSS 2.0 feed. You can leave a response, or trackback from your own site.